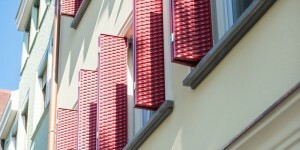 Sliding bi-fold shutters complete the assortment of solar shading offered by Griesser. Up to eight wings can be assembled. 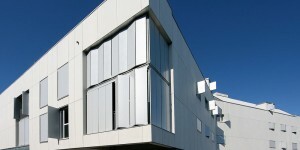 The elements are always in pairs at a right angle to the facade when in the opened position and can be manually shifted. When they are completely pushed together, the sliding bi-fold shutters require very little space. 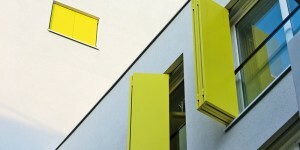 Select a color from our extensive color assortment to give your facade an individual character. Panel with fixed 50 x 10 mm slats made of extruded aluminum, slats somewhat opened, with two dividers for reinforcement, installed in a stable, continuous 71 x 33 mm frame made of extruded aluminum, baked enamel finish with surface from currently available collection. Panel with fixed 50 x 10 mm slats made of extruded aluminum, slats somewhat opened, with two dividers for reinforcement, installed in a stable, continuous 40 x 33 mm frame made of extruded aluminum, baked enamel finish with surface from currently available collection. Panel with fixed, stacked 50 x 18 mm slats made of extruded aluminum, slats stacked on top of one another, light-tight, with dividers for reinforcement, installed in a stable, continuous 71 x 33 mm frame made of extruded aluminum, baked enamel finish with surface from currently available collection. Panel with fixed 60 x 6 mm rhomboid slats made of extruded aluminum, slats somewhat opened, with two dividers for reinforcement, installed in a stable, continuous 70 x 30 mm frame made of extruded aluminum, baked enamel finish with surface from currently available collection. Panel with fixed, wide rhombic-section 60 x 15 mm slats made of extruded aluminum, slats with intermediate space, installed horizontally in a narrow, continuous 42 x 31 mm frame made of extruded aluminum, baked enamel finish with surface from currently available collection. Panel with fixed, narrow rhombic-section 35 x 15 mm slats made of extruded aluminum, slats with intermediate space, installed horizontally in a narrow, continuous 42 x 31 mm frame made of extruded aluminum, baked enamel finish with surface from currently available collection. Panel with fixed 60 x 15 mm slats made from untreated Siberian larch, slats with intermediate space, installed in a narrow, continuous 42 x 31 mm frame made of extruded aluminum, baked enamel finish with surface from currently available collection. 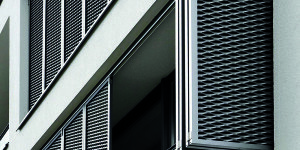 Panel with lining made of polyester fabric Soltis 92 or 86, fastened in place in the frame with weather stripping profile and stretching screws. Lining in a stable, surrounding 70 x 30 mm frame made of extruded aluminum, baked enamel finish with surface from currently available collection.. Panels with infill made of 2 mm aluminum sheeting, beveled and riveted on frames at the top and bottom and on the sides. Infill in a stable, surrounding 70 x 30 mm frame made of extruded aluminum, baked enamel finish with surface from currently available collection. Panel with infill made of 2 mm aluminum sheeting, beveled and riveted on frames at the top and bottom and on the sides. Infill in a narrow, surrounding 40 x 31 mm frame made of extruded aluminum, baked enamel finish with surface from currently available collection. Panel with infill made of 2 mm aluminum sheeting with perforation, beveled and riveted on frames at the top and bottom and on the sides. Infill in a stable, surrounding 70 x 30 mm frame made of extruded aluminum, baked enamel finish with surface from currently available collection. Panel with infill made of 2 mm aluminum sheeting with perforation, beveled and riveted on frames at the top and bottom and on the sides. Infill in a narrow, surrounding 40 x 31 mm frame made of extruded aluminum, baked enamel finish with surface from currently available collection. Signature line panels made of 2 mm aluminum expanded metal with approx. 10% view, riveted all around in the frame on the surface side. Signature on a narrow surrounding 42 x 31 mm frame made of extruded aluminum, baked enamel finish with surface from currently available collection. Signature line panel made of 8 mm Fundermax Uni-Decor plate, riveted all around on the frame, color and surface from currently available collection. Signature on a narrow surrounding 42 x 31 mm frame made of extruded aluminum, baked enamel finish with surface from currently available collection. Continuous track folding type G of extruded aluminum for ceiling installation, transparently anodized, with track with pivot bearing with hinges of stainless steel, with safety stopper. Continuous guide rails folding type G of extruded aluminum for floor or wall installation, transparently anodized, with guide rollers with pivot bearing with hinges of stainless steel, with safety stopper. Track and guide rails can be covered by panel. Continuous track folding type G of extruded aluminum for wall installation, transparently anodized, with track with pivot bearing with hinges of stainless steel, with safety stopper. Continuous guide rails folding type G of extruded aluminum for wall installation, transparently anodized, with guide roller with pivot bearing with hinges of stainless steel, with safety stopper. Continuous track folding type H of extruded aluminum for ceiling installation, transparently anodized, with track with pivot bearing with hinges of stainless steel, with safety stopper. Continuous guide rails folding type H of extruded aluminum for floor or wall installation, transparently anodized, with guide rollers with pivot bearing with hinges of stainless steel, with safety stopper. Guide rails can be covered by panel. Continuous track folding type H of extruded aluminum for wall installation, transparently anodized, with track with pivot bearing with hinges of stainless steel, with safety stopper. Continuous guide rails folding type H of extruded aluminum for wall installation, transparently anodized, with guide roller with pivot bearing with hinges of stainless steel, with safety stopper. Two-part, package with 2 panels on the left. Two-part, package with 2 panels on the right. Four-part, package with 2 panels on the left, package with 2 panels on the right. Four-part, package with 4 panels on the left. Four-part, package with 4 panels on the right. Six-part, package with 6 panels on the left. Six-part, package with 6 panels on the right. Eight-part, package with 4 panels on the left, package with 4 panels on the right. Eight-part, package with 8 panels on the left. Eight-part, package with 8 panels on the right. Impact buffers for stopping, secured at the building side.